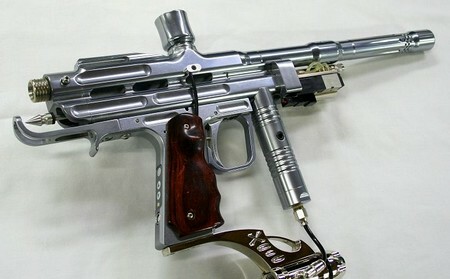 Custom made Paintball guns not only look better than a stock gun, but also perform better as well. To begin, remove the stock barrel (i.e. the barrel which was with the paintball gun) by twisting it counter clockwise until it has come off. Now you will need to screw on your new barrel by turning it in a clockwise motion until it has become firmly in place. A custom barrel is generally longer than a stock barrel as the longer length provides greater accuracy to the shooter. Custom barrels can be bought in multiple different colors and lengths. The most common lengths are 10 and 12 inches long. Next you may need to remove the clips at the back of the gun (some guns require you to, others don’t. Push the pins from the back of the gun, which is where the spring is being held in place. It is easiest if you use your thumb rather than your index finger. Remove the back spring case, which should be a small piece of plastic or metal. This is the thing that is keeping the spring in position. Put the expendable stock into the same place that the rear spring case was before you removed it. This stock is supposed to keep the spring in the correct position, while it also offers extra support for your shoulder by using an expendable stock. Now simply put the pins back into place, again using your thumb rather that your index finger. The next step is to take out the screws that are keeping the triggers guard in the right position. Most of the time you will have to use a Phillips-head screwdriver, although sometimes you may have to use a flathead screwdriver. You also have to remove any other screws that are currently holding the original trigger in place. The second last step is to remove the guns original trigger from your gun. Because you have removed all the screws it should come out easily, but if it doesn’t you may have to use force. The best way is to hit it with a hammer, although hitting it too hard will cause it to break. The final step is to place the new and upgraded “double-trigger” into the place of the original (or stock) trigger. You will have to screw the screws in (or if your guns uses pins, push the pins in) to hold your new trigger in place. If you want to you can then screw the triggers guard into place. It is not necessary, but certainly makes the gun look much better.